In a skillet, heat oil over medium heat. Add onions; cook, stirring frequently, until softened. Add chili powder and pepper; cook, stirring, for 1 minute. Add chili sauce, brown sugar, vinegar and Worcestershire sauce. Stir to combine, and bring to a boil. Remove from heat. Place trimmed pork in slow cooker insert and pour sauce over. Cover and cook on Low for 10 to 12 hours or on High for 6 hours, until pork comes apart readily. Lift out pork and place on a cutting board; using two forks, pull the meat apart in shreds. Return meat to the sauce and keep warm until ready to serve. 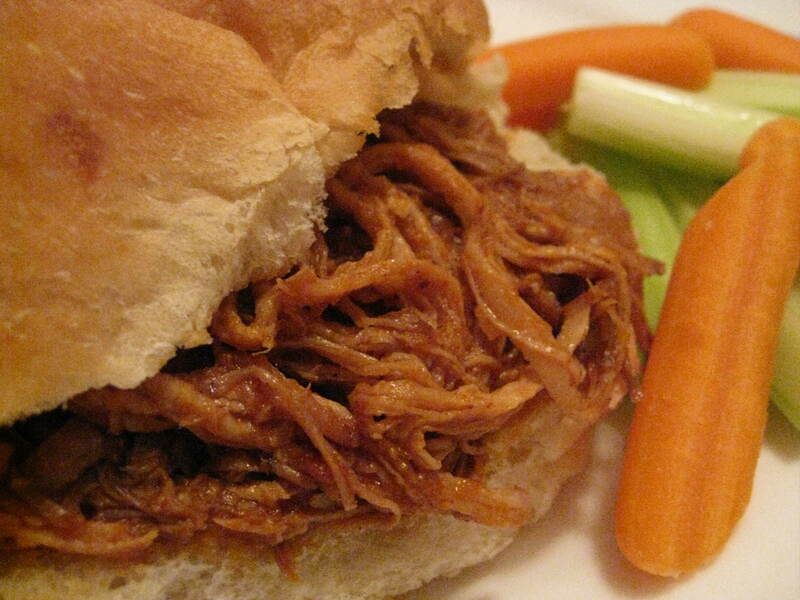 To serve, spoon shredded pork and sauce into buns. * Add 3 to 6 minced cloves garlic, if desired. Cook along with onions. * For a smoky flavour, add 1 tsp (5 mL) liquid smoke when you add the Worcestershire sauce. * Accompany the Pulled Pork with any of the following: veggies and dip, pickles, potato chips, coleslaw, sweet potato fries, or potato fries.